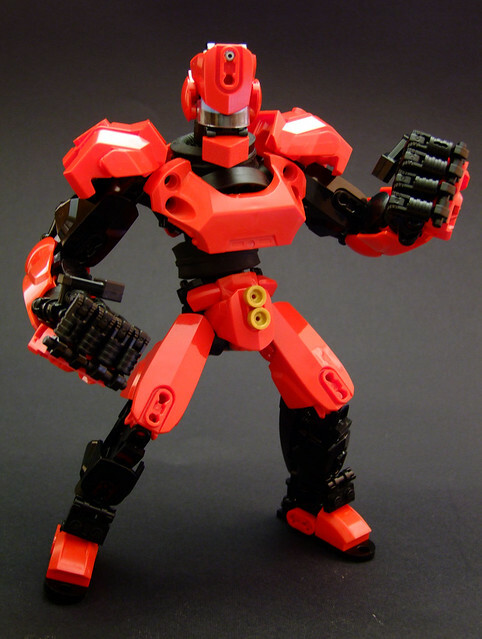 Djokson continues to produce wonderfully crafted figures by combining system elements and buildable figure systems. How does he do it?! This figure, the Crimson Crusher, is obviously ready for a fight. The body and especially the head are very sleek, but those large hands are my favorite part, using those nice joint pieces to create finger/glove texturing. This guy could easily fit into the film Real Steel. My name is Nathaniel Stoner, and I am an very active LEGO builder. I mostly build in the themes of castle and science-fiction, but I also dabble in other genres and create occasional random MOC's (My Own Creations). When I was younger, I would get and build small LEGO sets for my birthday, but I was never really into them. When they fell apart, I would become frustrated attempting to put them back together and would throw them in a box in my closet. I couldn't stand them! Then, miraculously, I became addicted to the LEGO brick later in my teen years. Ever since, I have continued to build up (pun intended) my collection of bricks and to expand my knowledge of techniques and building skills. LEGO is truly more than a toy, its an art form and a way to express yourself. For the most part, I collect LEGO Star Wars (mainly the minifigs), which is probably my favorite LEGO theme. I have a fairly decent collection, including some of the original 1999 sets, such as the Snowspeeder, X-Wing, and Naboo starfighter. I also collected LEGO the Lord of the Rings when those sets first came out. The minifigs are great, and the story remains one of my favorites ever. My hope is to inspire other young (and perhaps even older) LEGO builders to unleash their inner creativity! You can find me on my Flikr here.